A lot of hype was built around the Apple's WWDC 2013 conference and believe me it has lived up to the hype. 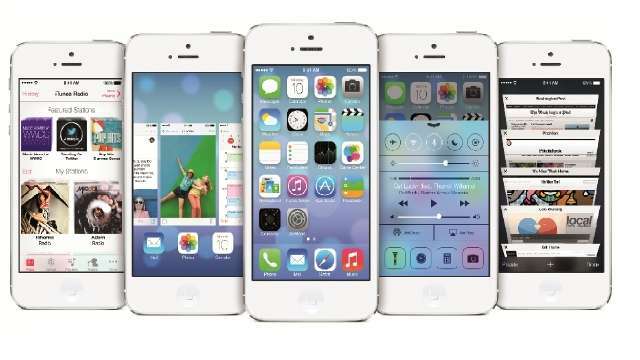 As I had written on my blog, Apple has made radical changes to the newly launched iOS 7. I would prefer the word a brand new OS, and you may agree with me by the time you reach to the end of the article. The byword for Apple engineers seems to have been change....! The current lot of iOS devices pale in front of the newly launched Samsung Galaxy S IV and Apple had to do something about it. 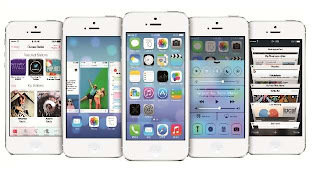 The result is iOS 7, a complete redesign of the marquee OS from Apple. And change it is, the changes become apparent from the lock screen itself. The new lock screen has a slider at the bottom of the display which has to be pulled upward for unlocking the phone. The notifications centre can now be accessed directed from the lock screen. Once you enter the chamber, the changes are ever more apparent. The icons have been redesigned and give a more surreal and utopian look which I found pleasing. Apple engineers have added a whole new bunch of animations at every turn. Folders on your home screens now support apps on multiple pages. The Apple iOS signature Apps like Messages, Game Center, Weather and Calendar all sport a new trendy look. The Weather app has great new animations which is almost similar to HTC’s weather App. The Calendar app is now redrawn and comes with complete white interface except for the appointments, which get new colours. The contrast looks smashing. Another Android follow method on iOS 7 is now you can now swipe between months and weeks. Messages has also gone for a flatter look. The text bubbles are more spacious then before and the white and blue design of the UI is consistent with the rest of the iOS colour symmetry The Game Center App now gets a new icon, instead of the antique green-baize table you get several intersecting bubbles. Its not just the bubbles Apple has introduced, the App now has a cleaner interface with a more prominent place for your friends’ profiles. The Mail app has also been rehashed and gets a symmetrical interface in iOS 7. It brings edge-to-edge images and the ability to delete emails with a slide, another Android follow. iOS 7 has been given a brand new Control Center feature, which lets users get to their regular settings by swiping up from the bottom. These include brightness, Airplane mode, Wi-Fi, Bluetooth etc. A very big plus is that now users can even turn on the torch and control the music player directly from here. WebOS type multitasking on iOS 7 is now possible with cards of all your open Apps popping up to help you. The iconic Safari browser has not been spared either. The new look browser now supports a full-screen browsing with options to open as many as 8 tabs. Another missing feature, the Parental controls have been added to the browser. And you get more integration between the desktop version of the browser. A new Photos App has been added to iOS 7. And the new App comes with very interesting pro Instagram filters. The new App's gallery has a new Moments features which arranges your pictures based on time and location and you can ‘zoom out’ to see a large chunk of time and the resulting mosaic of all images taken in that period. Just as I had predicted the Photos can be shared through AirDrop and iCloud and the app also supports photo streams where your friends can drop images to an album. Another plus from is for the new App because it now supports video-sharing via iCloud. The fight between Siri and Google Now has narrowed with the new Siri. It has got a new translucent background with two voices, male and female. Take you pick, they can now speak in French, German and English. The new Siri will now let you control Bluetooth and brightness and search through Twitter, Wikipedia and Bing. Another feature that Apple has added to Siri is the car integration, which I think will be the next big thing in mobile telephone. The Maps and iTunes can now be accessed via the display in their vehicles. They can also have their messages read back to them and can dictate texts to be sent while driving. This seems a bit fatal but a definite add on. With Honda, Merc, Nissan and Ferrari already on board for the integration, your new Merc can do all of the above. And the final piece of good news, Apple showed off iTunes Radio along with a redesigned Music app. The new streaming service lets you create stations based on your library and listening habits, and also share them with friends. As of now the free version comes with Ads and non Ads version is a subscription based one. The best is yet to come, the new iOS 7 will have a 'Activation Lock' I have written separately about the new feature. This is a complete departure from Apple from iOS 6 or I would prefer the word launch of a new OS. As you can see, Apple has included every bit of detailing in the new OS. Though iOS users may complain that it is more closer to Android now thus losing the iOS charm, but I think, keeping in with the times, the changes were more then necessary. Will keep you posted on the launch dates and other updates.